This is how to eat carbs if you are going to! 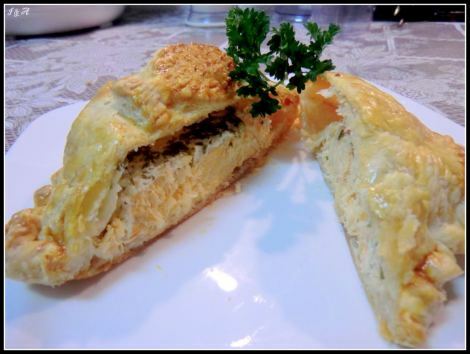 An elegant dish: Salmon stuffed Puff Pastry. Sea food is so delicious plus they say that eating fish twice a week is good for your health! Fish are a lean, healthy source with high level of proteins and nutrients (B-12 and iron). The omega 3 fatty acids in fish has so much benefit for your health such as reducing the risk of heart disease, lower blood pressure and to strengthen the immune system and so on and on. Fatty fish such as Tuna, Salmon, Oysters, Sardines, herring and Mackerel are considered as the most healthy fish. And you can do so much with it. Salad with fish or making soup etc. We saw so many fish recipes in one of the magazine and we love to get inspired and couldn’t wait to make/bake it our self. So a couple days ago we made a” Salmon en croute”.